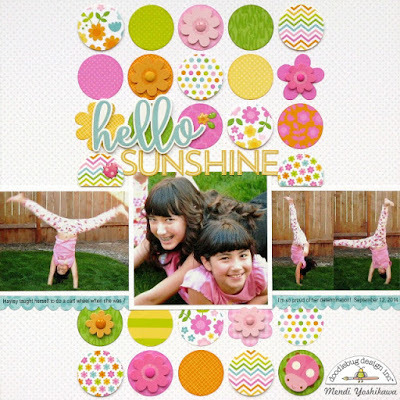 I have two things that I include on nearly every layout: circles and some shade of yellow. Christine joining you today to show how with this challenge I combined my love of both - I picked to work with Bumblebee for my color and I based my layout on a layout from Mendi that used a whole bunch of circles. Here's my layout! 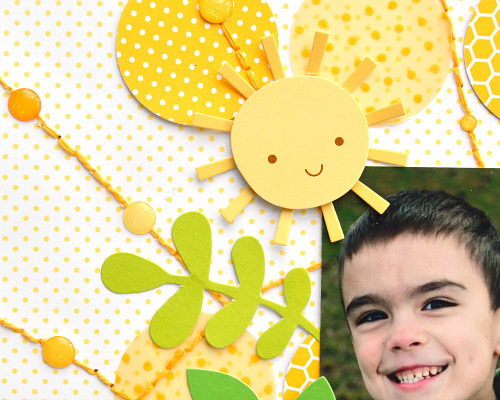 Mendi used tons of color on hers but I followed her design in using circles, three photos, and a similar background paper. Our family recently moved from Illinois to Ohio, One of the hard things to leave behind was a disc swing that my five year old had and loved. He spent hours every day on that swing. Our new home doesn't have any older trees that could support a swing like that. I took lots of pictures of my boy on that tree and wanted to document that smile before it faded too much! 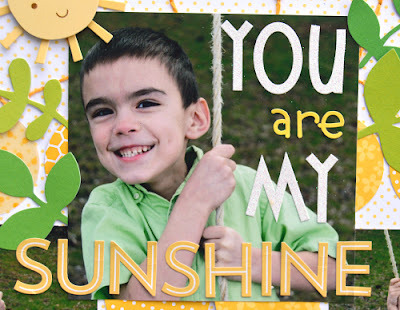 These pictures captured some of that joy and since he was outside it was fitting to highlight the sunshine! I used a combination of Shin-dig Sugar Coated Stickers, Teensy Type, and Icon Stickers from Spring Garden to create my title. 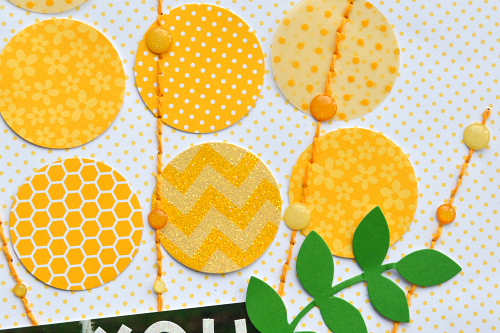 My circles came from a variety of places: Chevron Sugar Coated, Sprinkles Vellum, Kraft in Color, and Petite Prints. I hand stitched my sun and sun rays and then added in both regular and glitter Sprinkles. 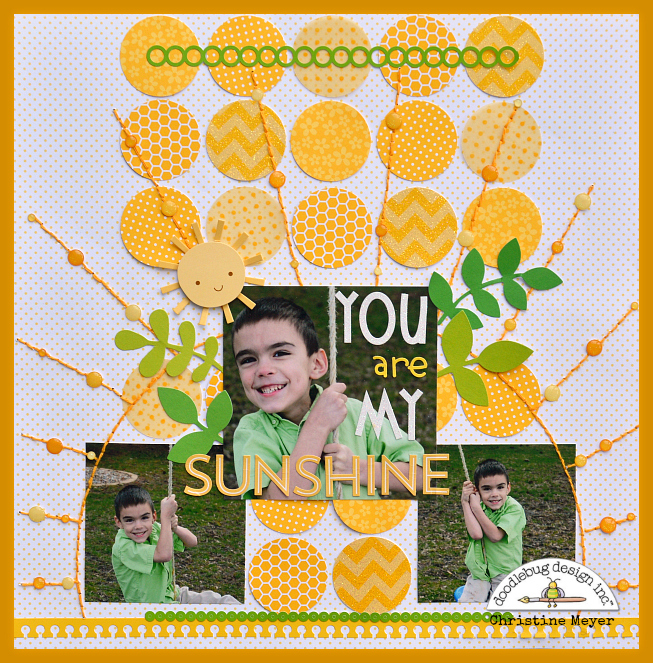 A few little pops of limeade green were all I needed to bring the whole layout together. You are going to love the rest of the Smash Up projects....be sure to keep checking in for the rest of the next two weeks! This is fabulous Christine!! I love his smile too!!!! There's something about the color yellow that just makes me want to smile. So this bright, happy and sweet layout has me grinning ear to ear:) Such wonderful photos! I love the stitched sunshine. A perfect way to document this special memory of your adorable son!